A new device hopes to mimic a bat's uncanny ability to navigate dark caves to map the labyrinthine underworld. Before we get into the tech, a bit of background on how Bruce Wayne's favorite winged mammal can fly through the dark without splattering against a stalactite. Bats use a process called echolocation to navigate their world. If you sit a bat in front of a wall, it can determine exactly how far away that wall is by making a noise then precisely judging how long it takes for the echo of its sound to ricochet off the wall and back into its bat ears. 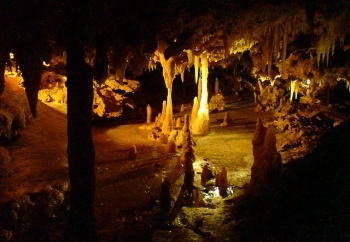 The animals are so good at this that even though they stereotypically live in caves which can stretch for miles underground (where there is so little light that native animals no longer see the need to grow eyes) the bats have no trouble flitting around, finding food and returning to roost every morning. Thus, it should come as no surprise that when humans want to map caves, we would blatantly lift techniques from bats. Enter: acoustics technician David Bowen. His new, unnamed technology essentially consists of a pair of microphones attached to a computer filled with custom audio analysis software. These two mics are set up at the entrance to a cave, then a gun is fired "four or five times, with about 5 seconds between each shot." The loud, distinct sound of the gun going off emits sound waves that flood the cave, ricochet off of every surface, and return to the microphones. According to New Scientist, the computer takes about "15 to 20 seconds" to display a map "with simple graphs that display the area of the cave at different distances, and written explanations of the data, such as '30 feet ahead is a large opening'." The New Scientist report also claims that a subwoofer can be used in place of gunfire, but that seems like a last resort only to be used in case you're feeling especially dull. I'm not just saying that because I like the idea of Bowen demanding caves give up their secrets before firing off a few warning shots, either. His team has near-future plans to test the system with a propane-fueled cannon, in the hopes that louder sounds might offer more detailed maps.